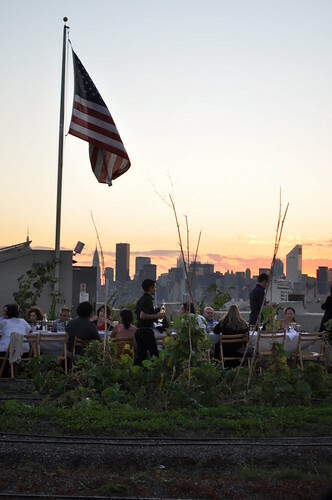 It's that time of year again -- that is, when Outstanding in the Field (OITF) makes its annual stop in the Big Apple for its farm dinners featuring guest chefs from the area. After last year's event at La Plaza Cultural with the husband-and-wife chefs from Print., I was very much looking forward to this year's extravaganza, so much that Linda, Jess, and I bought our tickets back in March (five months in advance!) when tickets are quickly sold out shortly after. 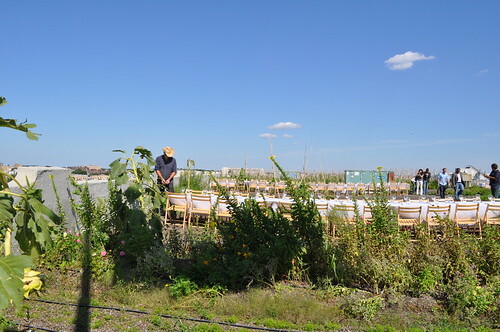 New York City was fortunate to have two farm dinners hosted by OITF this year -- one at Queens Farm (featuring Chef Marcus Samuelsson of Red Rooster) and one at Brooklyn Grange Farm (featuring Chef Dan Kluger of ABC Kitchen), both located in Queens. 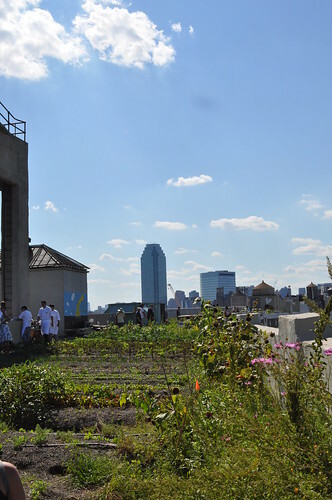 OITF has held dinners at Queens Farm in the past, so Linda suggested we sign-up for the Brooklyn Grange dinner as it is essentially a rooftop farm overlooking the boroughs of Manhattan and Queens. She had me at rooftop. So after (im)patiently waiting five months until we were on the M train over to 36th Street in Queens, we were finally there, ready to be swept away by the amazing powers of the local, the organic, and the sustainable. Now, if you remember my not-so-great review of ABC Kitchen earlier this year, you will understand my initial apprehension about this collaborated dinner with OITF. I desperately wanted for the dinner to be as amazing as it was last year, not at the expense of shifty service and mediocre locavore fare. However, I knew I trusted the judgment of the folks at OITF -- you wouldn't be running a successful, 12-year running culinary enterprise such as this if they didn't know what they were doing. So with my concerns pushed aside, I did my best to clear my mind of any preconceptions I had about ABC Kitchen upon arriving at Brooklyn Grange that night -- and I'm really glad that I did. I wanted to give the restaurant another chance to show me they were serious about its commitment to "offering freshest organic and local ingredients possible" and showcasing them to their highest flavor potential. 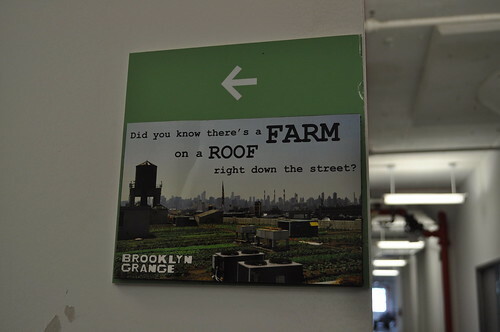 Clever postcard directing us to the rooftop where Brooklyn Grange Farm resides. 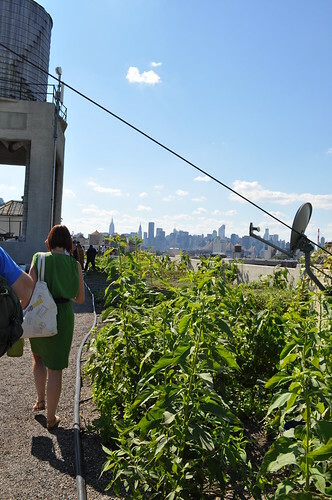 Once we took the elevator up a few stories followed by two flights of stairs, we finally reached the rooftop farm of Brooklyn Grange, where we saw the long tables where all the farm dinner guests would be dining. Traditionally, OITF has set the "long table" at farms, at gardens, on mountaintops, in sea caves, on island, and at ranches -- wherever its tours would take the table. 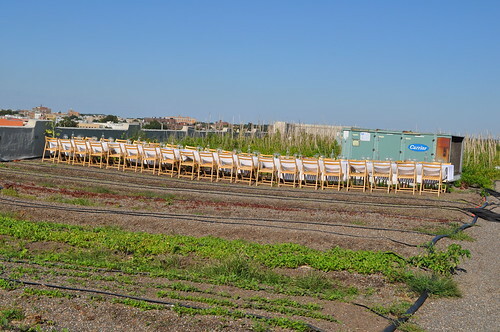 Only problem at Brooklyn Grange is that most of the space is used to cultivate garden and farm produce alike, so with the tight arrangement of vegetation, the placement of one long table to accommodate the hundred or so guests wasn't feasible. To compromise, the tables were broken up into three long-ish tables along vacant rows of soil. As I've written before, the mission of OITF is "to reconnect diners to the land and the origins of their food and to honor the local farmers and food artisans who cultivate it," and as a "restaurant without walls," each and every dinner hosted by the organization ensures the "consistent theme of honoring the people whose good work brings nourishment to the table." With that being said, the ingredients for these farm meals are almost all local (many times, as in the case here, sourced within inches of your seat at the table!) and generally prepared by a celebrated chef of the region (which, in our case, is Chef Kluger of ABC Kitchen). 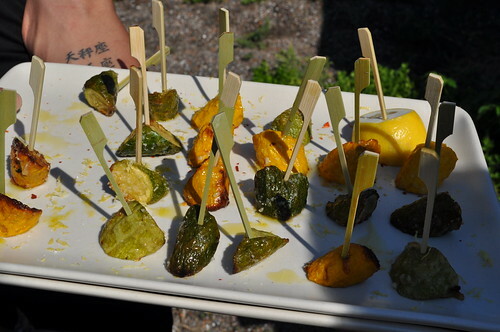 To read more about OITF, please see my post on last year's dinner in NYC (aka, my first OITF experience) as well as the organization's history section of its website! 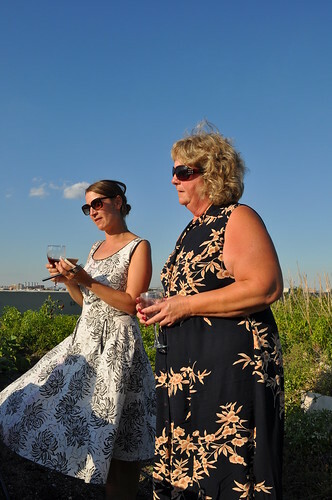 Once we arrived to Brooklyn Grange Farm, we were directed to walk over towards the other end of the roof for hors d'oeuvres and "bubbles" (what Linda likes to call sparkling wine). 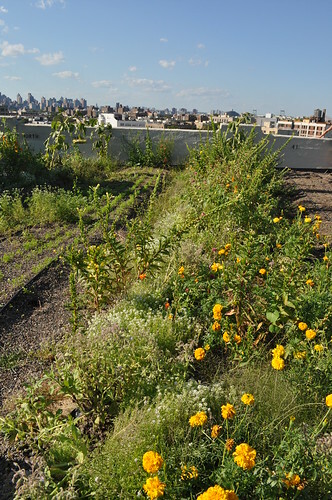 Brooklyn Grange is a commercial organic farm located on a rooftop in the Long Island City part of Queens. 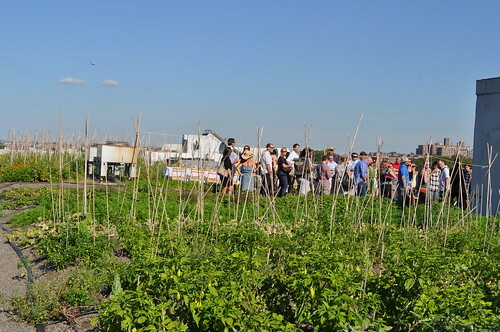 The farm grows vegetables in the city and sell them to local people and businesses, whereby its goal is "to improve access to very good food, to connect city people more closely to farms and food production, and to make urban farming a viable enterprise and livelihood." The farm measures about one acre (i.e., approximately 500 feet long and 70 feet wide) and is comprised of roughly 1.2 million pounds of soil and over 20,000 linear feat of green roofing material. 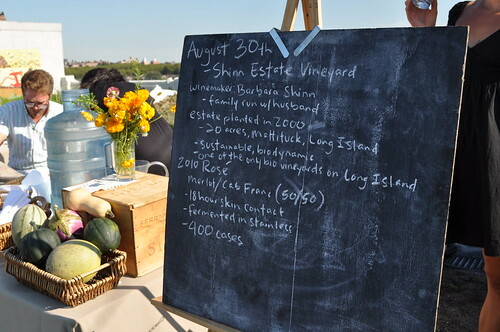 As for the wine paired with our meal that night, Shinn Estate Vineyard, a winery located on Long Island. We started off with a 2007 sparkling brut from Shinn Estate Vineyards. 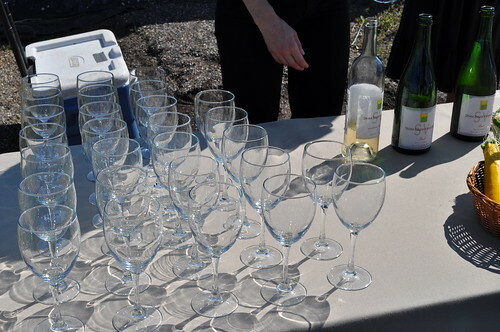 It was a nice crisp and light sparkling wine that paired well with the hors d'oeuvres. As a vineyard that is committed to being biodynamic, Shinn Estate's wines are all organic with an unusually precise harvesting process that involves the moon phases. Interesting approach, I must say! 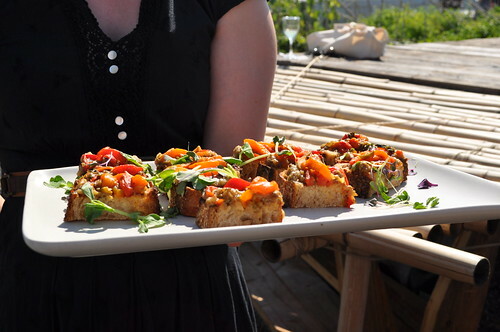 As part of our hors d'oeuvres (i.e., the first course), we had a roasted eggplant toast with peppers and lemon, where the bread for the toast was supplied by Sullivan Street Bakery. This was a nice starter, as the assortment of colorful peppers mixed in with the eggplant showcased what the flavors of the summer season. 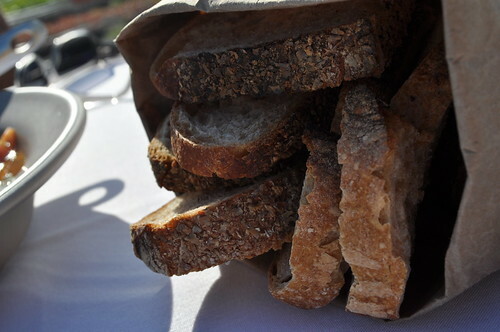 I thought the bread was a little bit chewy and hard, making it difficult to eat what was supposed to be "finger food," causing the toast contents to easily fall off I guess I was expecting the bread to be crisp and toasty, but given the conditions of having to prepare a five-course dinner not only outside but on a rooftop for a good number of people with limited kitchen appliances and supplies, I'm sure it was pretty difficult to top the toasts while maintaining a loose, crispy texture. 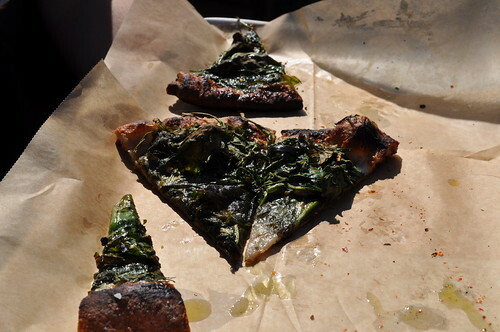 The kitchen also served herb pizza with spinach and goat cheese from Lynnhaven Farm of Pine Bush, New York. I'm not gonna lie -- I was wary of the goat cheese on here. The gaminess of it almost always turns me away from any given dish, but it really worked its magic on me here. The pizza had a nice layer of smokiness to it with the spinach in the limbo stage between raw and totally soggily cooked. 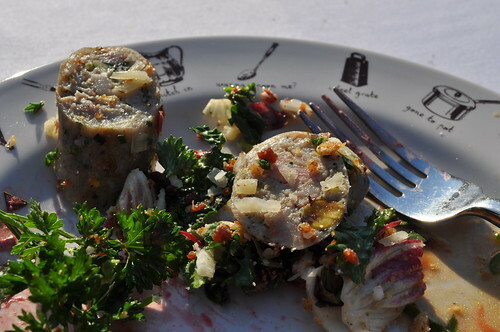 The goat cheese was what pulled it all really nicely together with its soft, creamy, and rustically elegant earthiness. The gaminess was mostly non-existent -- a big relief to me so I could fully enjoy the herb pizza. Linda mentioned that she and Jon pick up this goat cheese at the farmers' market at Union Square on Saturdays, and that it's really that awesome -- I may have to start doing that, too! Overall, I really relished in how the mere simplicity of the ingredients (quality ones, too, of course) could deliver such a profound reaction among all of us. It was a dish that could have easily been prepared at home that would have that mysterious panache given behind the scenes by the chef himself/herself in a restaurant setting. Last of the first course was roasted squash with Parmesan and lemon. This is another example of how the quality of the ingredients used (i.e., fittingly selected to be served during the peak of their season). 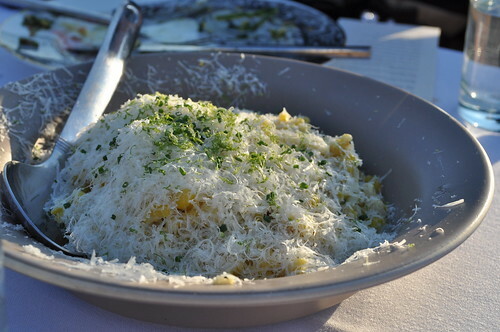 Something as simple as summer squash can be dressed to the nines with a casual sprinkling of Parmesan and a squeezed spritz of lemon juice. Succulent, juicy, and boldly crunchy -- all I can succinctly say about the roasted squash. Love the bamboo serving toothpicks! 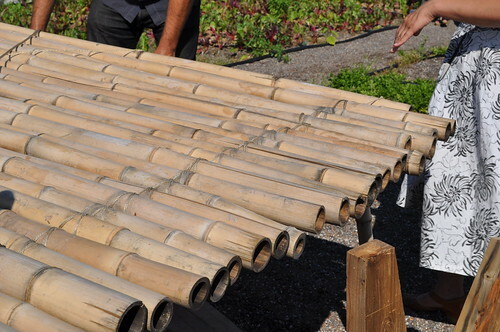 This was one of the tables made by the farmers at Brooklyn Grange. 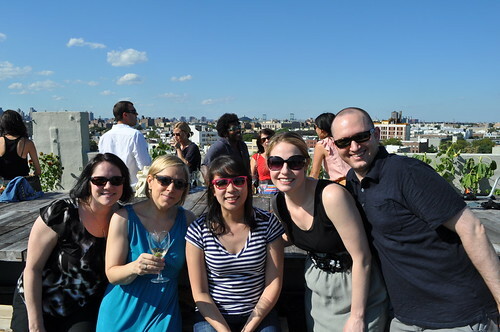 Group photograph in our fancy schmancy specs -- Lynnette, Linda, me, Jess, and John! After munching on our first course, Katy Oursler, the Director of OITF's Private Events, and Jim Denevan, the founder of OITF, came out to say a few words to the farm dinner guests. They briefly touched upon how the goal of OITF in its initial days was to bring the farmer to the forefront of the dining experience, so the chef(s) can step back a little and share the spotlight with the individual(s) who provided high quality ingredients to impressively showcase the chef's culinary imagination on a plate. 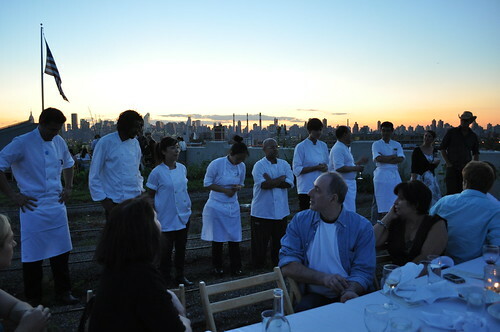 They also mentioned how this was the first time that they held one of OITF's dinners on a rooftop! 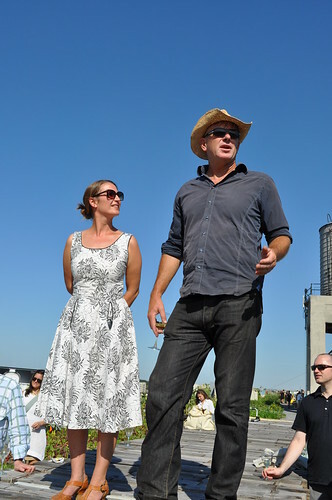 Mr. Denevan then turned it over to one of Brooklyn Grange's head farmer and co-founder, Ben Flanner. 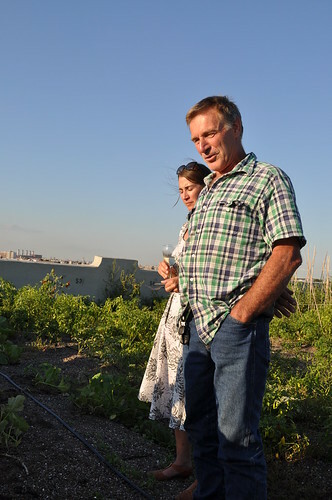 Another loss to the financial services industry to the food world, as Mr. Flanner was formerly a trained engineer with a background in finance before becoming an urban farmer. He gave all of the OITF dinner guests that night a brief overview about Brooklyn Grange, its history, and its inner workings. 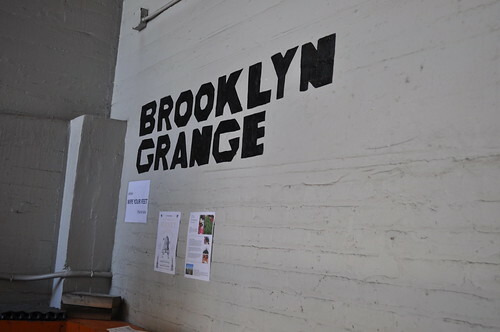 So you must be wondering why the farm called "Brooklyn" Grange would be located in Queens? I mean, there is already a farm by that obvious name (i.e., Queens Farm over in the Glen Oaks neighborhood), but that's not the real reason why it's called "Brooklyn" Grange. 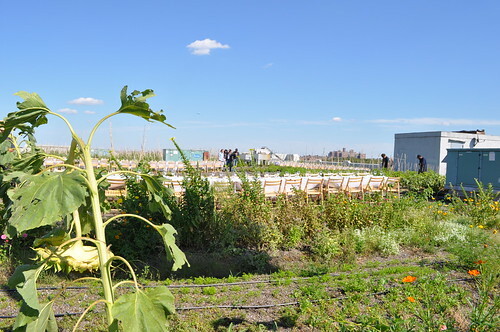 When the individuals behind the farm began their company in 2009, they thought they had a site in Brooklyn ready to be transformed into the urban farm they envisioned. As everyone had been living in Brooklyn at the time (and thus, had put together the business plan there), Brooklyn Grange made sense. 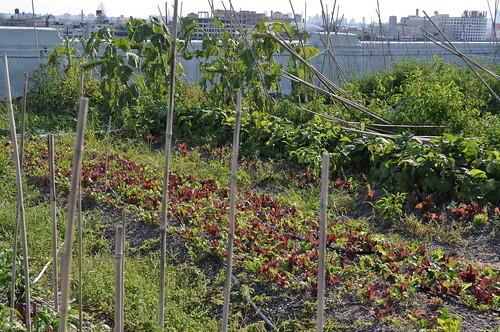 However, the initial site had fallen through in 2010, and the team had to begin looking for a new site, leading them to the farm's current home on Northern Boulevard in Queens (the Long Island City region). And at that point, the company had been chartered as an LLC under that name, and fundraisers and events alike had supported Brooklyn Grange. So to avoid any confusion, they kept the name, and here she stands in Queens! Once they found the space here, it took an unheard of two weeks (wow!) to put the deal together in 2010 during April/May. Since then, Mr. Flanner has been developing a green roof system with soil on this very roof along with a few beehives as well. 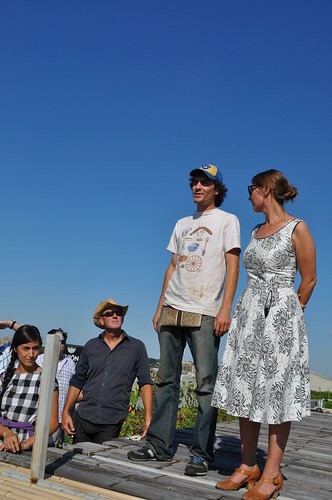 Working with an oblong rectangle as the potential farming plot on a rooftop, the folks at Brooklyn Grange have come to find that sun-loving crops (almost intuitive in this situation). 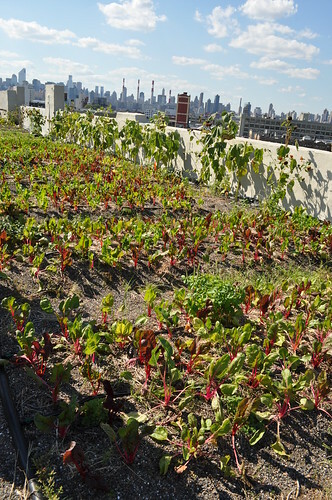 Ultimately, the aim of Brooklyn Grange is to take advantage of "unused" rooftop space to grow and yield amazing produce and ingredients. 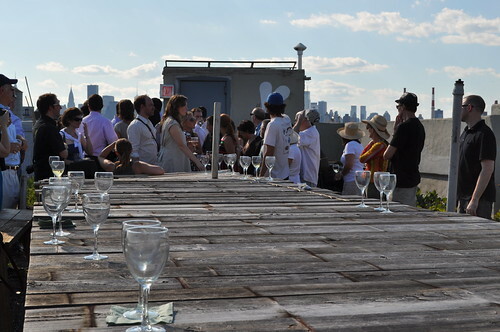 The space also makes for a very ripe place for sunset dinners. Mr. Flanner sharing more about Brooklyn Grange with the guests that night. Part of the rooftop farm. 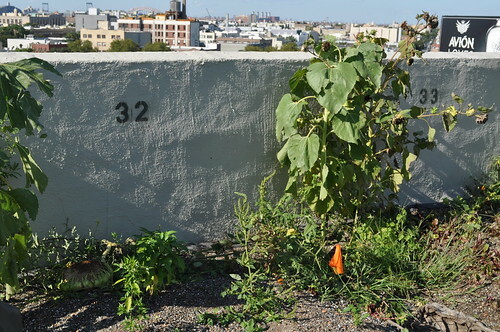 To keep track of the farm's crops, numbers have been stenciled along the walls of the rooftop. 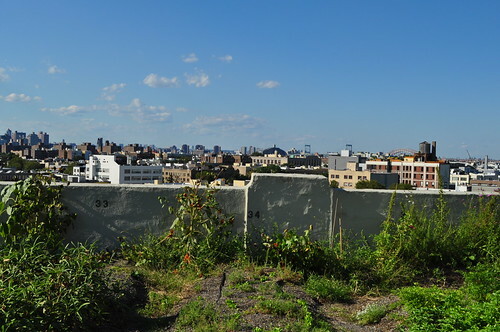 View of the city from Brooklyn Grange. 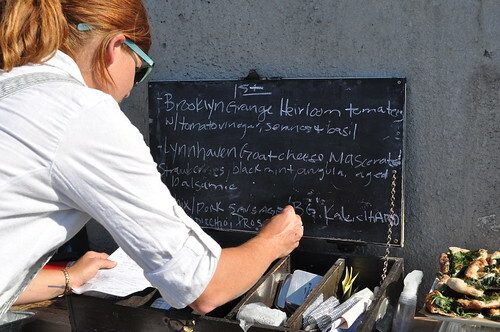 ABC Kitchen's menu for OITF that night! 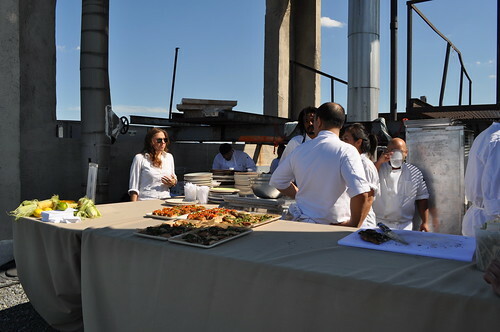 View of the "rooftop kitchen" used by the team from ABC Kitchen. Preparing for the courses ahead! 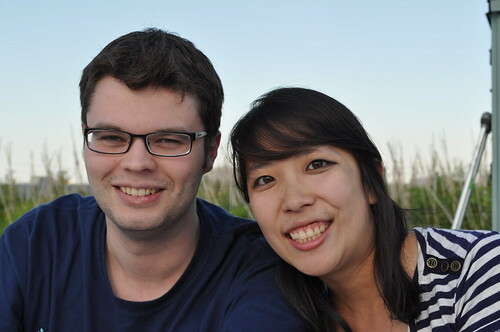 Other half of guests on a farm tour. And in true OITF fashion, after a tour of the featured site, everyone settles in -- "farmers, producers, culinary artisans, and diners" take their seats along the "long table." View of the table from where we were sitting. Artisan bread from Sullivan Street Bakery in a playful brown paper bag with a foldover opening. Marcus and me at Brooklyn Grange for OITF. 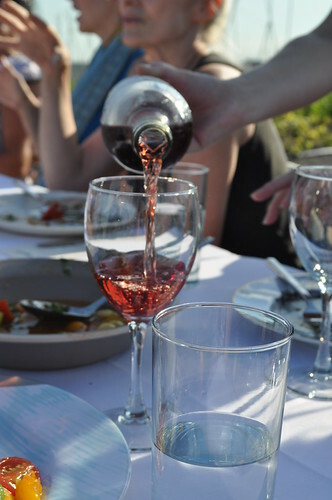 The first wine served during our dinner was a 2010 rosé from Shinn Estate Vineyards, which I found to be on the heavier side for rosés, but still light enough to enjoy over the second course that we awaited shortly after we were seated. The first dish within the second course was heirloom tomatoes from Brooklyn Grange with chilies and basil, all mixed with a housemade vinaigrette. 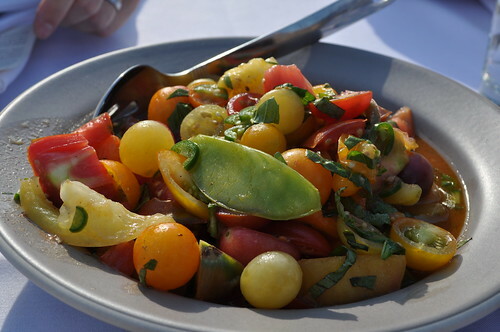 Sweet, juicy, and refreshing -- this assortment of heirloom tomatoes embodied everything a breezy summer day would be if it was personified into food. I don't think I've ever had tomatoes this lovely served salad style. The sweetness of the fruity tomatoes just blew me away. The basil definitely blended well into the dish as well, with those zesty chilies in good measure. 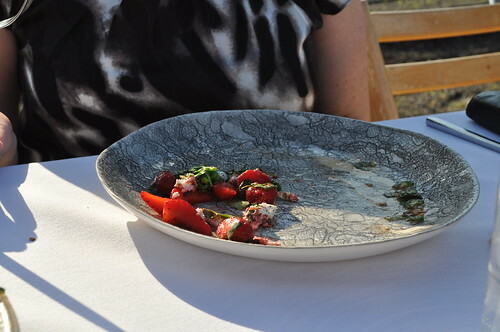 The next dish within the second course was an arugula salad with strawberries from Mountain Sweet Berry Farm, Lynnhaven Farm goat cheese, mint, and lime. Lynnhaven shocked me here once again with its amazing goat cheese that went incredibly well with the tart and seed-happy strawberries. 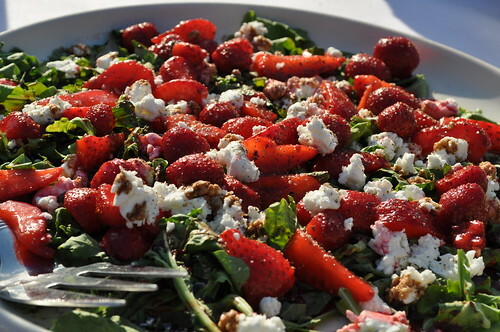 The mint and arugula rounded out the heavy flavors from the goat cheese and strawberries. All in all, great summer salad combination! Lynnette's new plate from Anthropologie! 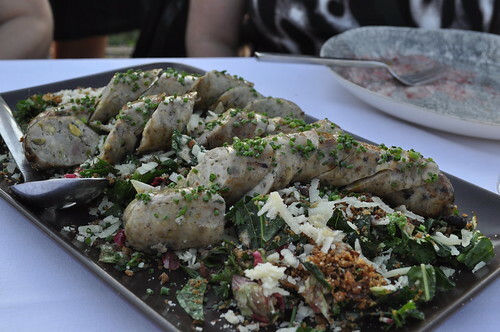 The last part of our second course was grilled housemade chicken and pork pistachio sausage served over Brooklyn Grange warm field greens, crispy prosciutto, sherry vinaigrette , chives, and cheddar-style cheese. 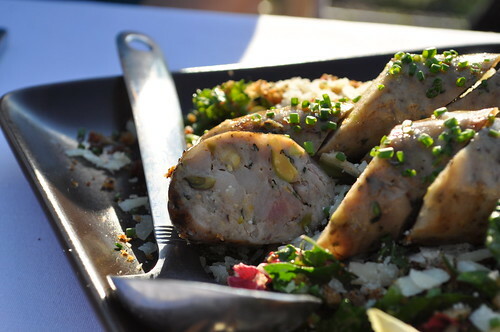 You can see the pistachios right inside the sausage -- what utter deliciousness we had here! Definitely top favorites of the night -- the pistachios inside the sausage itself and crispy prosciutto were enough to whisk me away into the night! The soft nutty flavor from the pistachios mixed in with the crunchy saltiness from the prosciutto with the sharpness of the cheddar made for a wonderfully crafted dish to bid farewell to the fleeting summer days ahead (at that point in time, that is) and to welcome in the imminent fall season blowing our way. The meat was lean and juicy filled with the hale flavors of chicken and pork. Besides, crispy prosciutto is almost like bacon, which always makes everything better. My attempt at some decent plating on my dish, haha. Ms. Oursler brought out Lynn Fleming of Lynnhaven Farm. She briefly talked about her farm and the products it sells at farmer's markets in New York State as well as New York City, which includes the famed goat cheese, feta, ricotta, as well as goat meat. Ms. Fleming emphasized her farm's commitment to humane treatment of the goats, both in the production of cheese as well as the butchering process. As previously mentioned, her farm sourced the goat cheese used in the herb pizza as well as the arugula salad. 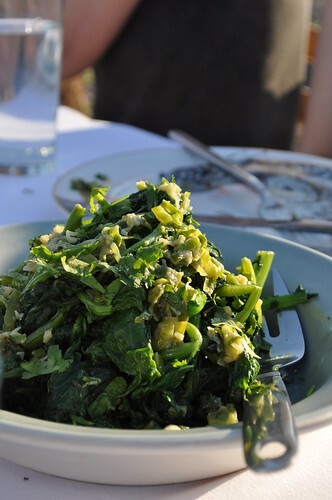 For the third course, the first dish comprised of grilled broccoli rabe with ginger and scallions. Normally not a fan of the bitterness of broccoli rabe, but the preparation here (and the sourced broccoli rabe itself) allowed for a softer, velvety taste. This, along with the below dish, was paired with a 2010 chardonnay from Shinn Estate Vineyards. 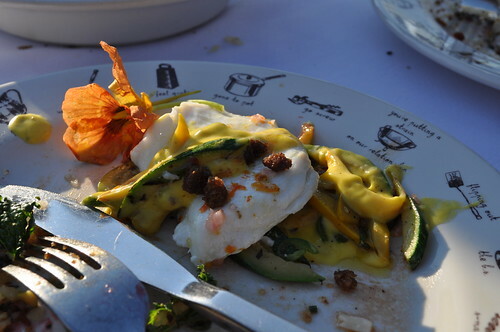 The second dish within the third course was the steamed halibut with Maxwell's Farm goldbar zucchini and nasturtium vinaigrette, topped with toasted pumpernickel chili bread crumbs. My other favorite that night, the halibut had the silkiest of textures that swam lightly in the custard colored nasturtium (Latin for "nose twister," most likely due to the common reaction from mustard oil in its leaves) vinaigrette. 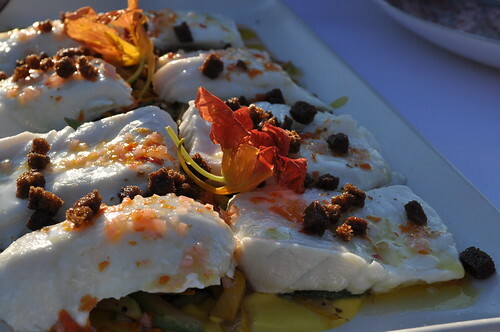 The chef even garnished it with a couple nasturtium flowers over the fish. It was pleasantly fragrant, in both scent and taste. And those toasted pumpernickel chili bread crumbs punctuated the dish to its ultimate potential -- these very flavorful pumpernickel crumbs that take the cake over any mediocre crouton. The goldbar zucchini from Maxwell's Farm was a delicious addition of color and vegetable to the meat/sauce heavier dish. Surprisingly delightful and sweet in taste, boasting the same effect the heirloom tomatoes had on me. Ms. Oursler later brought out Bill Maxwell of Maxwell's Farm located in Warren County, New Jersey, who supplied the goldbar zucchini in the steamed halibut dish. Along with zucchini, Mr. Maxwell's farm also grows tomatoes along with many other produce. For the fourth course, ABC Kitchen served sautéed corn with manchego cheese, jalapeño peppers, and lime. From the looks of it, I thought this was going to be overly shaven with cheese, but like with many of the courses that night, this course humbled my preconceptions into an unexpectedly warm and spicy side of corn that melted in my mouth. 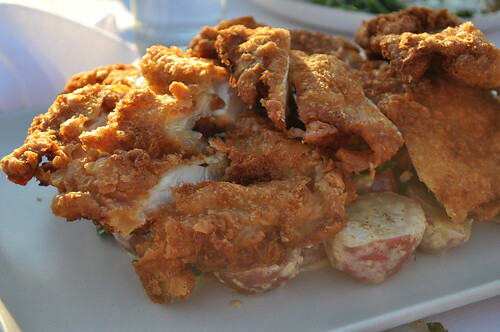 Along with the sautéed corn, the kitchen also served cold fried chicken battered with summer ale beer, served with a potato and whole grain mustard salad. I found it a bit odd for fried chicken to be served cold, but I gave it a shot. I found it to be just okay overall -- I suppose it was a better idea in theory than it was in execution, though the batter was pretty good. The potato salad was too mustardy for my liking, and the potatoes were not very soft. However, the wine that was served with this was probably my favorite wine served during the dinner. It was a 2008 Wild Boar Doe from Shinn Estate Vineyards -- talk about a play on words! Boar Doe = Bordeaux! So cleverly cute! It was also fittingly delicious and outstanding Bordeaux -- here, a blend of cabernet franc, merlot, petit verdot, and cabernet sauvignon. 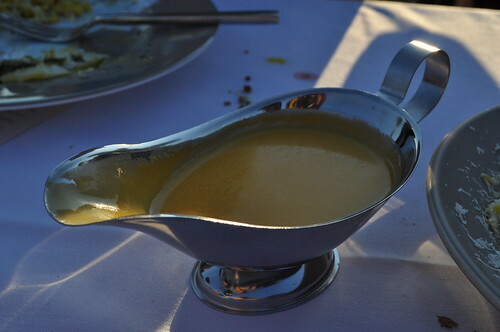 As a condiment for the cold fried chicken, the kitchen served a hot sauce butter with orange peppers, habenero peppers, quinoa, and lemon zest. The habaneros spoke for themselves upon first taste, giving the chicken a playful kick. 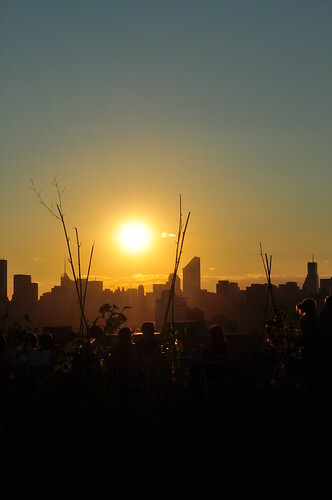 Watching the sunset from Brooklyn Grange rooftop. 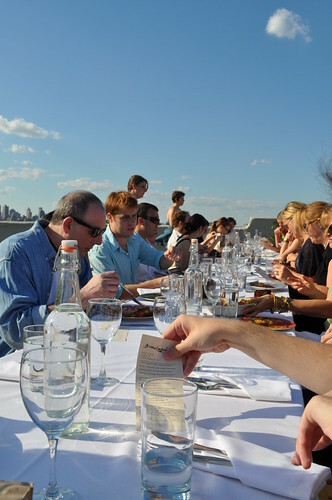 Diners, skyline, and sunset -- can't get much better than this! Our last course consisted of two desserts. 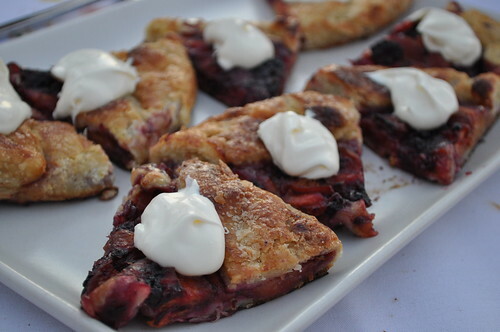 This one was the peach and blackberry crostada with crème fraîche. As a group, we found it to be just okay (mainly because the crostada that Linda makes is out of this world -- I will need to bribe her someone to make it again! ), probably because the crostada crust wasn't loose and crispy enough. Unfortunately, it was a tad soggy. Loved the presentation though! 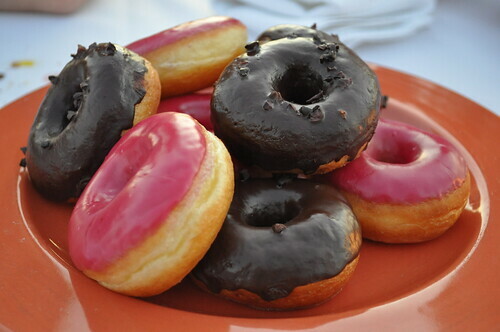 The second dessert dish was glazed donuts with a pink currant glaze and a chocolate glaze with cacao nibs. Again, dessert was a bit disappointing, but with so many beautifully orchestrated preceding courses, this was an afterthought to an otherwise fabulous night in Long Island City, Queens. 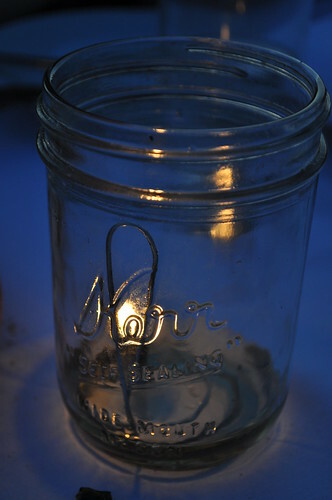 Mason jar candles are always present at OITF! The chefs of ABC Kitchen who worked hard to put together our dinner that night came out at the end to receive a gracious and welcoming round of applause from all the guests! I think there was a miscommunication to me on my part -- I didn't realize Chef Kluger wasn't able to make it to New York City that night due to the flight delays caused by Hurricane Irene. 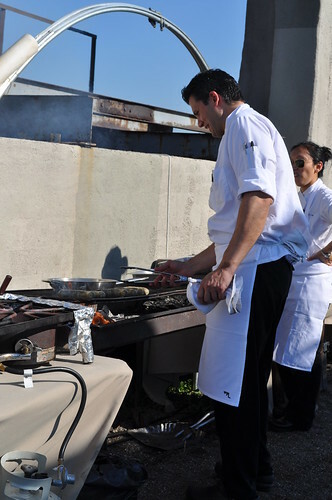 So his sous chef, Ross Mendoza, had taken the lead in the kitchen at OITF that night, bringing the guests a wonderfully prepared meal. No hurricane can stop a team of precise and passionate chefs! Findings: It was no surprise that Outstanding in the Field had worked its magic once again in New York City -- OITF was able to assemble, craft, and organize an astounding dinner with the joint collaboration of famed chefs, regional farmers, and local culinary artisans for the anxiously hungry guests that night. As OITF's aim, at these farm dinners, there is no mystery where the ingredients (comprising the courses during the meal) had come from. Chefs are no longer compelled to stand behind the heavy swinging doors in the kitchen, and farmers are no longer kept in a professional capacity as a supplier. Chef, farmer, and diner are all peers, sitting at a long communal table, where the exchange of ideas, thoughts, and inspirations can flourish into many possibilities. Here, the farmers' bounty, the chef's creation, and the diner's gastronomic gratification share a common denominator -- individuals that are passionate about food and the movement behind sustainable dining and locally-sourced ingredients. Chef Kluger and his chefs from ABC Kitchen certainly demonstrated this commitment to such a cause, as a team and as a restaurant. All of my negative feelings for ABC Kitchen subsided once the five courses unraveled before me at this OITF dinner at Brooklyn Grange. Embracing simplicity and letting the ingredients speak for themselves (with a little help from the chefs at ABC Kitchen, of course) worked wonders that night. There is something magical about the dinners and the resulting experiences that follow these dinners hosted by OITF -- there is a certain je ne sais quoi that it brings to the table (literally) and to the night sky just as the meal is coming to a close. Some may say that the price point here is a little bit much, but to me, it is worth every last penny. It serves as a lovely reminder, once a year, just how far a locavore meal can take you and just how captivating it is to eat produce when it is at its seasonal peak. So as I've said last year (and expect to say for years to come), I am very much looking forward to next year's dinner, where I know to expect nothing less than an impressive orchestra of exciting flavors, inspiring individuals, and stimulating dinner guests. 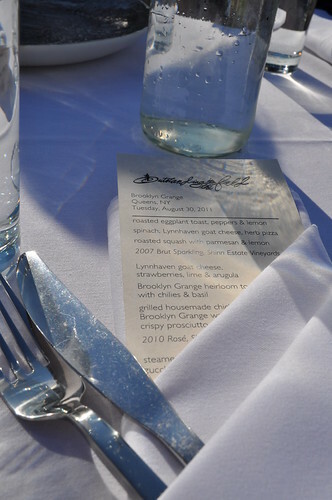 Price point: $220 for a locally supplied 5-course dinner with wine pairing by local vineyard. 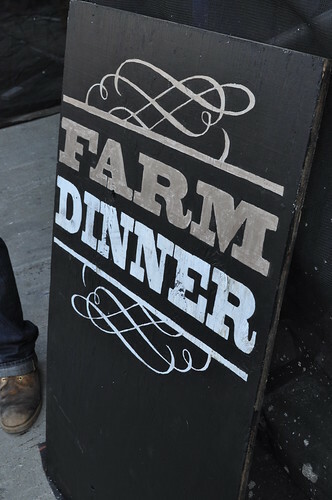 * from what I recall, farmer(s) from these farms were in attendance at this OITF farm dinner! I've read about this online before...looks wonderful! It was wonderful, Melissa! :) if there are any in your part of town, you should definitely check it out!